The second song on The Beatles' second album, All I've Got To Do was started and completed in the same productive session that also saw the band begin recording I Wanna Be Your Man and Little Child. Lennon was reportedly inspired by Smokey Robinson, and the opening chord and general lyrical theme recalls The Miracles' You Can Depend On Me. That's me trying to do Smokey Robinson again. The Beatles recorded All I've Got To Do in a single recording session, on 11 September 1963. In his biography of Paul McCartney, Barry Miles claims that Lennon played the song to McCartney just before they began recording it. It took the group 14 takes to get the song right, though eight of those were false starts. They also recorded an overdub, which became take 15, the version used on the LP. Although a strong John Lennon song, All I've Got To Do was never played live by the group; perhaps its stop-start rhythms would prove too subtle to be heard above the screams of Beatlemaniacs. What a great song!! Anyone thinking Ringo was not the greatest in their early years needs to listen to the tasteful arrangement he does on this great tune. Lennon’s vocal is as soulful as can be. I never get tired of listening to this. It really sums up the vibes of the era. Hello to all, I will say that here with ALL I’VE GOT TO DO The Beatles further prove that they were ,even early on , the masters of spontaneous talents. I know for a fact that this song ALL I’VE GOT TO DO was NEVER performed past the recording of it on September 11th 1963. It never made it to the stage.BUT with out or with it still stands as a great tune that was learned that very afternoon in London by the other 3 Beatles who each put their wonderful souls on the recording. IMHO One of John’s best. Raw emotion. And the lyrics are quite clever, because first, it’s all about the girl who’s there for a guy and with just one line, he changes the song to make it about his love for her as well. Umm…..A good little song eh? Nice drums and guitar. I like it. I bought the Complete Beatles Songbook on Amazon,com and I have been going through the songs, This one “All I’ve got to do” I love to play. The chords and arrangements. The Beatles played very sophiscated cords in the early days and made them work well. It gives me a great many hours of enjoyment. What was the Overdub of? Apparently either backing vocals or the opening chord, but nobody seems to be entirely sure. I don’t know why no one ever mentions that “Oh, Darling” begins with exactly (or almost exactly?) the same chord. It seems as plain as day to me yet I’ve never read it remarked upon anywhere. When I first heard “All I’ve got to do” I instantly thought it was “Oh, Darling” because of what seems to be the identical chord. “Oh! Darling” starts with an E5# chord, with the B sharp on top. In the left hand, the bass chord is E-B-E from the bottom up, with normal fifth! The opening chord of All I’ve Got To Do is G#9b(omit the fifth/D#), with E as the bass tone. A beautiful chord, often used by Bach and Sibelius. I’ve always noticed that and you are the first person to put it in print somewhere. Nice! Never noticed this before, was wondering if anyone could confirm – isn’t that John harmonizing with himself on the “All I’ve gotta do!” refrains throughout the song? If so, this marks yet another time he did this on on early Beatles’ recordings (“Little Child”, “I Don’t Want To Spoil The Party” other two quick examples I can think of) – interesting to ponder when in a band with two other such capable (one great) singers. Another way John really dominated the group in the early years-probably had a very specific way he wanted some of his songs to turn out that he thought only his voice would accomplish. I believe it’s Paul doing that harmony. I certainly sounds like him. When the word “all” is sung, it sounds quite a bit like Paul’s voice. John’s would have been more cutting. Oh also, it might be worth adding to the song that, “According to Dennis Alstrand (from his book “The Evolution of Rock Bass Playing; McCartney Style”), this song is the first time in rock and roll or rock music where the bass player plays chords as a vital part of the song” (from wikipedia article) – yet ANOTHER innovation from our favorite band, and one they never get credit for, if true. No end to their genius, apparently. That’s interesting! He must be referring to electric bass specifically – I can think of at least one pop song (“Alley Oop”) in which the standup bass player plays chords. Anybody else out there hear Ringo’s squeaky bass drum pedal on here? I first heard it on the album when I was “lit up” and listening through headphones back in 1974. Now, with all the remastered tracks out there you can really hear it. Or am I hearing things?? What about that opening chord?! E11 aug… (Fretted, low to high 076575). Try it you’ll like it. Peace and love – peace and love. I’m listening to the original mono vinyl LP and you can’t miss it. Same applies on the Please Please Me album you can hear it all over the place. When CDs first came out they made a big thing about hearing Ringo’s pedal squeak as if CDs brought something new. It was always there! CDs were such a con….. Yes – I’m not the only one who hears the squeaky pedal! Yay! A beautiful song from a beautiful album. I was just 7 when my elder sister bought it home and this song is “With the Beatles” sound. That´s Paul harmonizing (John could never have reached that high tone. An absolute John´s song, he leaded the Beatles music style up to 1965 when Paul started to involve much more on it. You are correct that Paul sang the harmonies in this song. However, in the last bridge John does indeed hit the G#, twice. Check it out. This song reminds me a little of “Time of the Season” by the Zombies. Actually, “Time of the Season” reminds me of this. Years ago, my family was on a trip to southern Indiana, & this song came on the radio (WLS-Chicago). My father turned it up because he liked it, but was surprised to find out that it was The Beatles. He thought it was the Monkees! Dad loved music, but didn’t necessarily pay attention to the artists. He once said his favorite Beatle song was “Jet”…ha! Lol this reminds me I recently read somewhere that George was asked sometime in the 1970s what the Beatles sound would be if they had not split up he said something to the effect if you want the answer just listen to Wings. Or The Beatles with Yoko as the fifth Beatle? Except John and George never would have been in it…maybe Ringo too!! This is easily the most captivating song on the album. Wonderful vocals from John, along with the funky rhythm guitar throughout. Sounds like a Strat. I’ve played it over and over and intend to learn it. An amazing Beatle song!! Read somewhere that John specifically tailored the lyrics for the American market. He said it wasn’t a typical practice for boys to call girls on the phone in England. Ringo’s drum pattern is an early take on several other drum beats in later songs, ie, ticket to ride. Same drum beat just a different variation of it. Charlie Watts did a take on it in Honky Tonk Women. Great Beatle song! It’s likely that the drum part was inspired by Arthur Alexander’s 1962 song Soldier Of Love (Lay Down Your Arms), which The Beatles recorded for a BBC session in July 1963 (it’s on Live At The BBC). Interestingly, on that recording Ringo played a different drum pattern. This is a great song I have to admit. I wonder why they never sang it in a concert? Beautiful John Lennon composition and lead vocal. A real highlight of “With The Beatles”. One of their underrated, “unsung” classics — at once edgy and haunted, romantic and restless. The drums and vocals are equally astonishing. If you think about it–what genius– Lennon played it for Paul right before they recorded it, I am a guitar player and it is a great song to play. But the other 3 Beatles heard John’s demo and they filled in beautifully. and I might add Quickly. I saw Paul McCartney recently and he played “Its getting Better” and he said that this was the first time he played it since they recorded it. Just like this one. Some they recorded and never went back to again. Incredible. Once again John Lennon creates a haunting vibe with his voice. Lennon’s voice is so evocative and though perhaps not as sweet a McCartney’s it had timbre, and when added to its intensity and pitch it was instantly mesmerizing. It was singularly Lennon’s vocals which drew me to the Beatles as a child. I had no idea the Fab four wrote their own songs or played their own instruments. Finding out the Beatles were as complete a combo as there could ever be was the icing on the cake for me. Long before I saw images of the Beatles, I heard their music, and it was songs like All I’ve Got To Do which I heard on the radio which made me save my pennies from my paper round to go out an buy their records. The family portable record player did not do the Beatles music justice, but above all, Lennon’s voice and his driving rhythm guitar lead the early Beatles albums, and with Paul, George and Ringo the resultant sound was unbeatable. 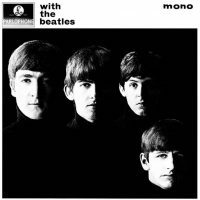 Others have said that All I’ve Got To Do is a standout song on With The Beatles, and I tend to agree, but we are blessed because the second album by the Beatles was fresh, FAB and fantastic. The Beatles live set was barely thirty minutes in duration, and because they released songs and albums frequently fitting a song into the playlist must have been a difficult choice. Who would have heard the intricate song structure over the screaming teens anyway? One of my favorite tunes due the beautiful simple lyrics and an incredible Lennon vocal. To imagine such a mature song was capable of such a young group is truly amazing. I wish I could hear the 14 takes of this song. I pray Apple releases all the tapes before I die. It’s way overdue. It’s not doing any good sitting behind a steel door. One of the very few early beatles recording without double-tracking. It makes the voice more pure . They should remix some early recordings without the double-tracking vocals and release it.